As a centerpiece of Portland’s Ten Year Plan to End Homelessness, Bud Clark Commons (BCC) represents a new approach to providing dignified housing and comprehensive services to help those experiencing homelessness. Funded by a combination of low-income housing tax credits, urban renewal funding, and HUD stimulus dollars, the project sets a new standard by combining permanent supportive housing and temporary shelter with a community resource center. Located at the gateway to downtown Portland near historic Union Station, BCC sits between the Pearl District, an upper-income mixed-use neighborhood, and Old Town/Chinatown, a district undergoing an unprecedented level of redevelopment. The LEED Platinum project achieves a perceivable balance between the rigorous programmatic requirements of a coalition led by the City of Portland, a progressive design approach, and sustainable building practices. The project’s mission is to provide a continuum of services to help transition homeless individuals toward stable, permanent living arrangements. The architecture helps achieve this goal in the expression of both form and function: a walk-in day center with public courtyard and access to services; a 90-bed temporary shelter; and a separate and secure entrance to 130 efficient, furnished studio apartments for homeless men or women seeking permanent housing with support services. Sustainability at BCC meant creating a durable place of dignity for our most vulnerable citizens while treading lightly on the planet. The team creatively combined three disparate program elements with similar missions on a tight urban site, conserving land and maximizing the city’s density, mixed-use, and transit-oriented goals. The designers considered the users’ health and wellbeing in every design decision, and employed energy-saving technologies, materials, and construction methods to ensure that public resources were used wisely. The key environmental issues at BCC are particularly complex given its population. We had to consider the need for outdoor space for users to congregate, wait for services, and to experience nature amidst an urban environment. Access to daylight was balanced with the need for privacy, achieved with filtered views, borrowed light from courtyards, and relites. Clear, safe, and efficient wayfinding was essential; simple entrances and ramps to each public program component allow for universal access. The key concepts for this project were social equity and the triple bottom line: sustainability that includes financial, social, and environmental performance measures. We wanted to create an energy-efficient building for financial sustainability, environmental stewardship, and as a distinguishing element to support the mission of this vital facility. Homelessness is not sustainable for the individual or the city. Nearly 2,000 people are on the streets each night in Portland, Oregon. Contributing factors of unemployment and long-term poverty range from domestic violence, untreated physical and mental illnesses, and disabilities to alcoholism and drug abuse. The costs and impacts of homelessness are significant and difficult to quantify, so we committed to achieving sustainability in a second way: social sustainability and those immeasurable qualities of the human condition, safety, independence, and health. The project provides 130 permanent apartments for the most vulnerable homeless, many suffering from compromised mental and/or physical health. The 90-bed temporary men's shelter is offered to clean, sober men actively looking for work. The project’s Day Center offers support services such as drug and alcohol counseling, showers, telephones, mail service, job training, classes, and community space, available to any male or female homeless individuals on a walk-in basis. Parking was intentionally excluded to save space for critical program elements and to maximize the use of nearby alternative transportation choices including light rail, train, and bus services. Drawing people off the street, BCC’s courtyards have become transformative places that set forth a positive environment of hope, dignity, and respect. The building had been conceived as a full-block, two- and six-story building with wood construction, but it was revised to become a half-block, 8-story concrete structure. The smaller footprint reduced the cost of land acquisition, and the greater height is closer to the maximum allowed on its site, making it a better fit for the city’s density goals. The exclusion of parking lots or spaces promotes density and infill on what was a brownfield site, turning zero floor area ratio (FAR) into 6:1 FAR, maximizing allowable zoning density and height goals, while creating a gateway building and icon at the entrance to downtown. The brownfield site had previously housed a gas station and parking lot, which required intensive soil remediation tactics and the careful removal and treatment of much of the site’s excavated soil. Responding to BCC’s ecological context, the team minimized excavation to avoid disturbance to groundwater, due to the building’s low elevation and proximity to the Willamette River. Additionally, innovative stormwater management treats runoff from the adjacent bridge with green street planters. Siting of the building was a delicate balance of trying to conserve half of the block, utilizing grade change to maximize universal access to multiple floors, and addressing appropriate street frontages for both the users and the city’s goals around the public realm (retail wants to be on light rail line so we oriented away from 6th avenue toward the less-trafficked Broadway). The design team realized that the micro-residential units would be primarily heated by the residents and refrigerators inside, so there was less need for robust heating technologies. To further reduce or eliminate the need for non-renewable energy resources, the team incorporated strategies such as solar hot water, graywater harvesting, heat recovery ventilation, green power purchasing, and electric (as opposed to natural gas) air handling units. Courtyards were situated to maximize exposure to sunlight both now and when projected future developments are completed on the adjacent lot to the east, and on the block across the street to the south. The team placed the courtyards as far away from future shadow lines as possible. Additionally, the team selected many species of native, drought-tolerant plants for the courtyards, which are more likely to thrive in the local climate. The building’s residents and staff greatly benefit from natural light, plentiful clean air, and energy-efficient lighting. The ample daylighting and views of nature give users a connection between indoors and outdoors. Courtyards and balconies are additional sources of light, and areas on each of the eight floors also offer some access to the outdoors. Floor-to-ceiling windows on the ground level extend the length of the west façade, the abundance of glazing allowing natural light to saturate the interior. A comfortable year-round temperature is maintained through a highly efficient sensor that shuts off the heater when the window is open. Fresh air is circulated into each apartment through a heat recovery system. An issue unique to this project type, tuberculosis control necessitated additional air exchange rates and UV air treatment in assembly and group living spaces. Displacement ventilation strategies, which are extremely rare in homeless shelters, provide maximum air changes without sacrificing comfort for a compromised population. BCC features eco-roofs and stormwater treatment systems that are well integrated into the two courtyards. Rainwater is collected from roofs, and then exhibited in the courtyards via stormwater planters designed in concert with public art. A significant innovation of this project includes graywater harvesting on a large, urban scale—rarely if ever incorporated at homeless facilities. The graywater recycling system captures water from showers and washing machines to flush toilets, reducing the water needs and usage of the building. Low-flow plumbing fixtures further reduce water usage in the building, and a solar-powered hot water system provides almost all of the hot water needs for the building year-round. A landscaped courtyard with seating, tables, and a bioswale water feature provide a transitional space between the street and the safety of the day center. Native landscaping, non-invasive species, low water use, and zero permanent irrigation results in zero stormwater runoff. The team created lush outdoor courtyards and vegetated roofs where there was previously asphalt, a welcome change for wildlife and humans alike. BCC earned LEED Platinum certification, with public savings from the use of energy-efficient technologies estimated at $60,000 per year. BCC features a range of highly efficient systems, including one of the largest solar hot water heating systems in the Pacific Northwest, satisfying 80% of the building’s hot water needs. The building’s tight and highly efficient thermal envelope significantly reduces its heating load. A heat recovery system for residential units, Energy Star appliances, and low-flow plumbing fixtures throughout the building further enhance energy and water savings. The project’s lighting design exceeds energy code requirements by 25% through the use of fluorescent and LED sources. Extensive electrical and water metering allow for the tracking of mechanical, lighting, and water system performance. The building performs 51% better in terms of energy efficiency and 53% better in water efficiency than a typical similar building. 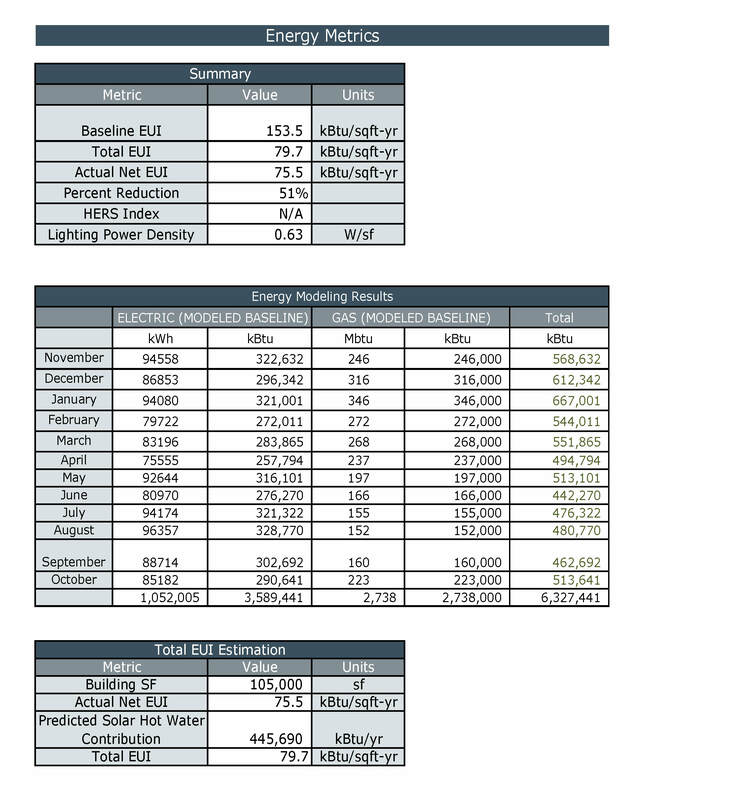 While the building is more heavily used than originally anticipated, the energy savings compared to the typical similar building is still significant. Between the efficiency strategies and the purchased green power, the project meets the current 2030 Challenge target of 60% CO2 reduction. Most importantly, the resulting utility cost savings allow for more funds to be directed to BCC’s mission and the services it provides. Materials for this project were chosen specifically for their ability to optimize the health of residents, many of whom suffer from illnesses; durability and maintenance; and energy use, given the public nature of the project and its need for cost savings. The building features two courtyards that are both constructed with durable materials such as painted concrete and weathering steel, a recycled and recyclable product. Many materials used in the building’s construction are either locally sourced or sustainably harvested and produced, including local brick, local concrete, and local, FSC-certified interior siding and trim. In an effort to reduce the amount of materials used on the project, its concrete structure serves as the flooring and ceiling in many areas. The use of thicker continuous exterior insulation allowed us to eliminate insulation in the stud cavity. We incorporated Passive House concepts for the residential floors with high-performing fiberglass windows and continuous insulation “perfect wall” assembly, in addition to an IRMA roof that keeps dew point and moisture out of wall and ceiling cavities. Additionally, a building-wide recycling plan, recycling stations on each floor, green housekeeping training, and free green supplies for tenants help promote recycling and environmental stewardship for occupants. Durability was a top priority for this publicly funded, sustainably minded project. The team made constant and deliberate value decisions to invest in long-lasting solutions rather than accepting immediate savings; examples include solid surface counters, solid core doors, higher performing windows, durable brick and concrete skin, and post-tensioned concrete structure (as opposed to wood framing). The team designed BCC to be a 100-year building, but parts and pieces are meant to be accessible and replaceable over time as technologies improve or advance. Examples of these replaceable parts include the rooftop equipment, solar hot water system, and windows. Notably, the windows were specifically designed to be replaced without impacting the brick façade. The building’s concrete structure is a durable framework that allows for future uses. It was purpose-built but could potentially be repurposed for senior or student housing, or a long-term-stay hotel. The layout and program are conducive to these other potential uses: a courtyard leads to a welcoming lobby, with community and administrative spaces, a commercial kitchen, yoga and art rooms, and efficiency apartments with galley kitchens. BCC is showing measurable results in both promoting housing stability among Portland’s homeless, and in its building performance. In the year following BCC’s opening, the client served more than 7,000 homeless persons at the day center and kitchen, including approximately 200 veterans. More than 3,600 individuals have been connected with social services, and more than 350 permanent housing placements have been made. We are conducting ongoing monitoring of building performance via mobile electrical meters that measure performance across the building and analyze plug loads and power demand. One important lesson learned emerged from commissioning the building’s innovative graywater. The designers used the only graywater system manufacturer licensed by the state at the time. There are graywater systems that are plug-and-play for small residential applications, and there are full-blown custom-designed commercial systems, and we tried to do a hybrid of the two. However, the system was too residential for this scale of development and intensity of use, so we had to revise it to utilize more robust pumps and filters, and streamline maintenance procedures to ensure staff safety. We were truly on the bleeding edge of commercial graywater for this size and type of project, and have many lessons to share. Funded with limited public monies, rigorous cost-benefit analysis was performed to support decision-making throughout the design process. Because the client, Home Forward, plans to own and occupy Bud Clark Commons building for years to come, the project team evaluated several energy conservation measures by life cycle cost rather than the traditional first cost. Energy and water conservation measures, with simple paybacks over longer periods than are typically accepted by building owners, were implemented to provide reduced building operations costs. With long-term occupancy, additional savings are anticipated to be realized as energy and water rates continue to increase. To financially support the sustainable design elements, the project was able to shift funds committed to the building operation to fund the energy efficiency measures based on the annual energy cost savings these systems would achieve. The energy and water conservation measures studied for the project include heat recovery, efficient boilers, highly efficient envelope, solar hot water, and graywater reclamation. The estimated payback for these measures is a combined 14 years. PreDesign: Arguably no building before Bud Clark Commons has had this complex program mix of homeless services on such a tight urban site, much less with such aspirational goals for sustainability. Combining three specific and intense uses in a vertically stacked program required an intense research phase before we could design the building. The entire design team held charrettes, public workshops, and visited other cities to better understand the problem and learn how this singular solution could begin to take shape. An "all hands on deck" approach was taken with the owners, engineers, consultants, contractors, tenants, neighbors, social services advocates, and the homeless community to foster a sense of ownership of the project by the entire community. Design: Designing for people experiencing homelessness required a deft understanding of how to create warm and inviting design solutions that also stood up to high levels of use and sometimes abuse. We had to create a healing environment that lifted people's spirits while ensuring that the building could be easily cleaned, maintained, and repaired due to the extreme level of use. We liken the project to trying to combine the welcoming environment of one's home with the durability of a penitentiary. The Bud Clark Commons integrates Portland's commitment to environmental and social sustainability. The quality of space is elevated by its integration with building performance strategies. Location in an urban brownfield site in a gentrifying part of Portland is a bold statement. The project houses homeless people with convenient transit access. It doesn't feel institutional; the design fosters and encourages community within the complex through interconnecting interior and exterior through transparency and connection to the street. Performance focused on indoor environmental quality including daylighting and ventilation techniques to address tuberculosis concerns. Energy performance was enhanced through the use of solar thermal heating and domestic hot water.